The Hi5-3G converts 3G-SDI, dual or single link HD-SDI, or SD-SDI to HDMI v1.3a for driving HDMI monitors. HDMI v1.3a capability at 30 bits per pixel allows full support of the latest 10 bit monitors. 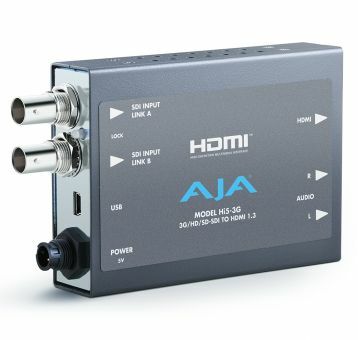 Audio is supported in the HDMI output allowing a convenient single cable audio/video connection. Hi5-3G provides 2-Channel RCA style audio outputs for separate audio monitoring if needed. USB connectivity allows for easy PC/Mac setup and field upgrades.